Looking for an easy way to help Baker School PTO raise funds? We need parent volunteers to sign up to sell cold treats (ice cream sandwiches, Italian ice, popsicles, whatever you choose) on Fridays after school at 1:40. All you need to do is buy the supplies (we will reimburse you!) 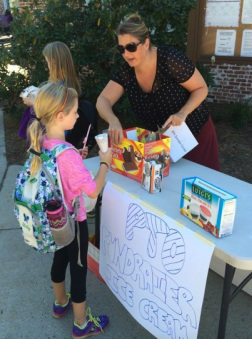 and sell outside the front of school (table and sign provided) to all our hungry kids. It's that simple. And to make it even easier you can pair up with a fellow Baker parent to help! PTO will sell treats in early Fall and Spring weather permitting.